Spot Leigh Rubin's whimsical bunny signs at the SLO Botanical Garden, which is open to the public every day from 9:30 a.m. to 6 p.m. For more information on Drawing Inspiration, visit rubescartoons.com. Famed Nipomo-based cartoonist Leigh Rubin is a cowman. Heifers make regular appearances in Rubes, his daily cartoon that's syndicated in 400 media outlets worldwide. He even co-created a life-sized cow sculpture with a cape (dubbed Adventure Cow) for the CowParade in SLO a few years back. 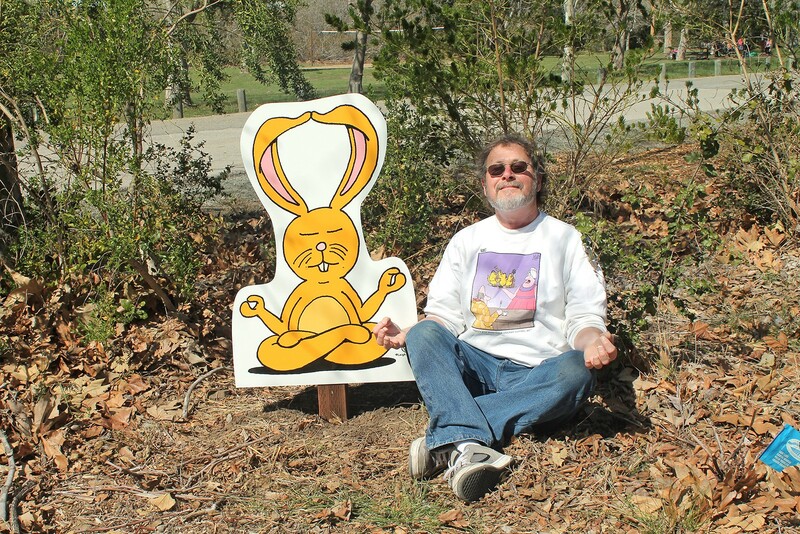 ZEN Cartoonist Leigh Rubin relaxes with his creation Lounging Bunny at the SLO Botanical Garden. But when the SLO Botanical Garden asked Rubin to design some adorable cartoon signs for the kids' areas, they had another critter in mind. "I typically do a lot of cows, but they wanted bunnies," Rubin said. "I can't picture it without them here now." Still, within the 10 signs that debuted in March—which included a meditating bunny, bunnies frolicking among the flowers, and faceless bunnies at the ready for an Instagram shot—Rubin managed to sneak in a cow or two. 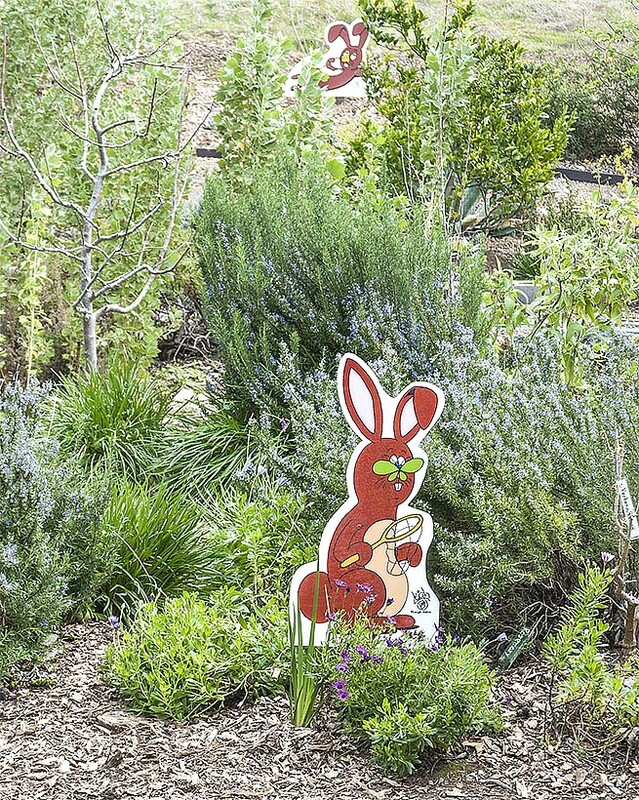 Garden goers will get a chuckle out of the sign that features a cow dressed in a bunny suit, attempting to blend in by nonchalantly chomping on a carrot. IN THE GARDEN Pollination and Pick-A-Flower Bunnies are just a few of the new cartoon signs at the SLO Botanical Garden designed by Leigh Rubin. "People love it," Lindsey Collinsworth Morgan, education director for the garden, said. "The kids will take pictures, they'll try to find all of them. It's really sweet. It brings a lot more life out to the garden." Growing up, Rubin knew he wanted to do something with art, but he wasn't sure what. As a teen, an after school job at his dad's print shop led him to create his own greeting cards. His daily cartoon, Rubes, was first published in the Antelope Valley Press in 1984, in which Dr. Frankenstein laments to his sad-looking monster creation, "Honestly Frank you forgot the groceries? You'd forget your head if it wasn't screwed on." 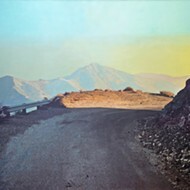 Rubin admitted that his work has only gone up from there. "You can always get better," he said. "There's always room for improvement. It really was bad, but it got me started." The cartoonist has definitely had an unconventional career path. He and fellow creative, Ryan Johnson, a special effects fabricator born and raised in Santa Maria, have talked for years about getting into the nitty-gritty of unusual careers on an interview show. Finally, on April 18, the duo premiered pilot episodes of their show Drawing Inspiration at Portland's Design Week. "We both have unusual jobs and the idea is to go behind the scenes with people that have unusual professions that they're passionate about, whether it's music, arts, medicine," Rubin said. "It doesn't matter where the inspiration comes from. And during that I'm drawing cartoons about it." The first episode focuses on Rubin and Johnson's collaboration designing Adventure Cow for the CowParade in SLO in 2016. 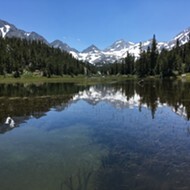 The second takes viewers to a Western movie ranch in the Los Angeles area, where Rubin and Johnson learn what it takes to make an authentic Western movie. Rubin interviews the show's subjects, but Johnson, as the show's director and cameraman, also chimes in, charmingly breaking the fourth wall. The two are currently in the beginning stages of marketing Drawing Inspiration to major networks, as well as sites like Netflix and Hulu. 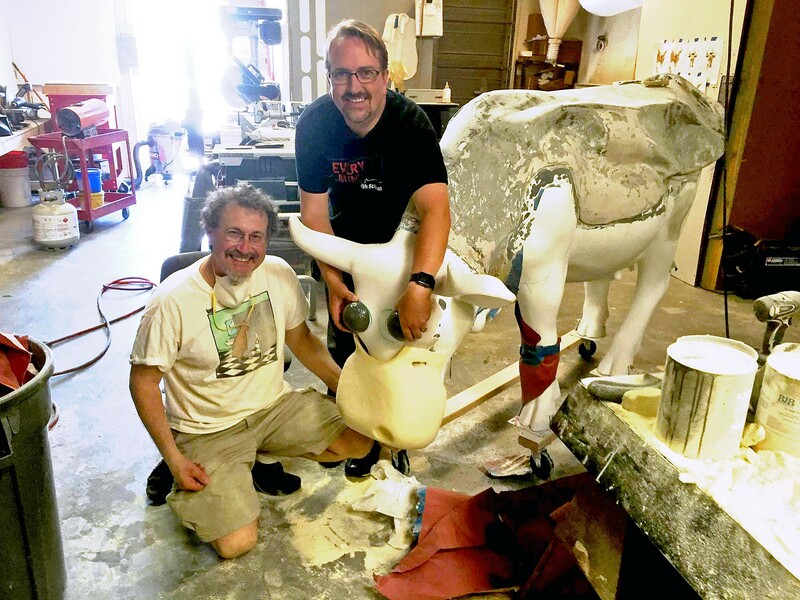 BEHIND THE SCENES In the pilot episode of their show, Drawing Inspiration, Leigh Rubin (left) and Ryan Johnson (right) talk about the process of creating Adventure Cow together for the CowParade in SLO a few years back. "There's all kinds of interesting and fun ways to find inspiration," Johnson said. 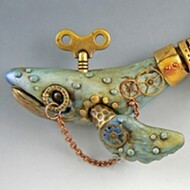 "And creativity is a great starting point and a great way to contribute to the world at large. We're hoping it'll find its audience. This is a show that's needed right now because it's so positive." Arts Editor Ryah Cooley is doodling at rcooley@newtimesslo.com.